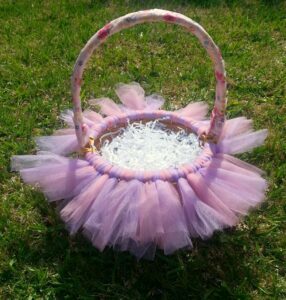 You can make your own one-of-a-kind Easter basket. You can find many of the supplies at your favorite thrift store. We found ours at our favorite Goodwill of Orange County store. Basket – easily found at your favorite Goodwill store. Look for one with open weaving. Tulle – can be purchased for just a few dollars at your craft store. We used 2 spools which were 20 yards each. We cut 34 strips of purple tulle and 34 strips of pink tulle. Depending on the size of your basket, you made need a little more or less. Step 1: Cut the tulle – First cut pieces to 6″ x 12″ (use as many colors as you want). Using two pieces of the cut tulle, fold in half horizontally twice to make a skinny long piece. Then fold the piece in half horizontally. Step 4: Placing the knots close together, repeat until the whole basket is covered in tulle slip knots. Many of you know that we are thrift store junkies around here. We love to recycle, re-purpose and reuse the treasures that we find. If you are like-minded, we invite you to visit our popular Pinterest board, Goodwill Finds Repurposed, where we share great ideas from clever and thrifty DIY decorators. We would love to connect with you on Pinterest!